Hello everyone! I first want to thank Sammee for hosting me, and letting me talk a bit about my book, Ordinary Magic. It’s the story of Abby Hale, a 12yo girl who lives in a world were magic is simply an everyday thing. But not for her, because Abby soon learns that she’s an ord — one of a small sect of the population that can’t do magic, and that are looked down upon by the people who can. As you can probably guess, this causes her problems. Have you ever heard the quote “Any sufficiently advanced technology is indistinguishable from magic”? I’d heard it long before I placed it, but it’s by Arthur C. Clarke, and it was in the back of my mind all while I was writing Ordinary Magic. He probably didn’t mean it this way, but I kept thinking about it in reverse — that if advanced technology was indistinguishable from magic, then magic could be indistinguishable from technology. That you could have a fantasy world that ran on magic, and felt very much like our contemporary world. The reason it kept jostling around my head was because of Abby. Abby Hale is twelve years old, the youngest of five, and a recently discovered ord. Abby is the one telling the story; it’s first person pov, so we see everything through her eyes, hear it through her voice. And Abby’s voice is not that of a ye-old-fantasy child. Her voice is that of a modern girl, someone who lives in a world very much like ours. Fortunately, Patricia Wrede was there for me. I don’t think I’ve ever thanked her properly. It probably would be kind of weird, seeing as I don’t know her personally, though I do adore Dealing with Dragons. But I would not have been able to handle all the world building in Ordinary Magic — juggling with what I knew about Abby with what I wanted for her world — if it wasn’t for Wrede’s fantastic and exhaustive questions on the SFWA website. (http://www.sfwa.org/2009/08/fantasy-worldbuilding-questions/) Without those questions forcing me to think about (more or less) every aspect of Abby’s world, the writing probably would’ve gone a lot rougher and Abby’s world would make even less sense than it does now. I discovered Wrede’s questions pretty early on, while I was still toying with the idea of writing Ordinary Magic. So when I decided to take the leap, one of the very first things I did was sit down with every single one of those questions (or at least, every one that applied) and tried to fill them out in as much detail as possible. Trade routes, tidal changes, religious influences. It took me several days, but it was absolutely worth it. If anyone’s considering writing fantasy, I’d urge you to at least take a look. It helped me to get everything settled in my head, even if it didn’t end up making it into the book. Which, to be honest, a lot didn’t. Because of Abby. I totally blame her. I mean, I love her, but I blame her. I’m just imagining this world — Abby actually lives there, and while she has many fine qualities and I adore her, she has a tendency to take things for granted. A lot of things. Especially when they’re things that she deals with in her everyday life, which caused trouble because the story is from Abby’s pov. Case in point, Abby’s Dad. He has a small shop on the back of their house where he weaves magic carpets, which took me an embarrassingly long time to figure out. Abby didn’t mention it, because to her that was just something her dad did. It was obvious, so why should she mention it? To be honest, prying things out of Abby was the most difficult part of the world building. Especially when she caused me problems with my editor, who called me on not explaining enough about the world Abby lived in. Having gone through this, I’d have to say that world building has to be one of the trickiest things about writing fantasy, at least for me. How much do you show? How much do you need to show? How much can you ask your audience to accept, and how do you know when it’s too much? How do you make it feel real even if everyone’s flying around on magic carpets and taking classes with minotaurs? Why is it some authors can make it look effortless, and how to I get to be more like them? It’s been my first go at this, so I can’t say how well it worked out — that’s for my readers to judge for themselves. But I am happy how it turned out. 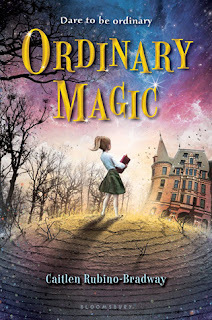 Thanks again to Sammee, and please check out Ordinary Magic, in UK bookstores tomorrow. You can find Caitlen on Facebook and Twiiter. 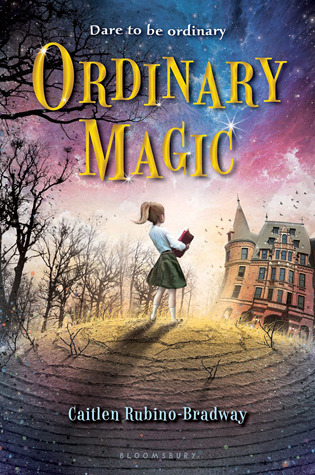 Ordinary Magic is published 13 September 2012.